Transferring from a sell-out run at Hampstead's Downstairs theatre last year, Phil Davies' Firebird tackles the ghastly undercurrent of child sexual exploitation that blights so many of this country's towns and young people. 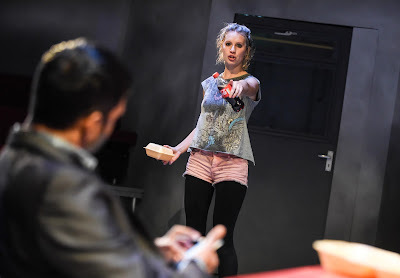 Pitched in a fictional Northern town, the play is at its most touching in the exchanges between the deeply harmed and 14yo Tia (played by Callie Cooke), who has been placed in local authority care since a baby and her friend Katie, who by contrast has at least a loving mum in her life and a background sheltered from ruthless violent abuse. The play opens with a well worded exchange between the two kids, that subtly hints at Tia being, in her words "damaged goods". In what is Davies' first full length play, this dialog displays a talent for carefully crafted drama. The one act play concludes with this opening scene continuing - however in between the two halves of this poignant park-set scene, Davies' subjects us to the horrors Tia endures and its here that his dramatic structure weakens. We shift from the brilliant pathos of the two girls' friendship (and Waterloo Road's Tahirah Sharif who plays Katie is a carefully crafted turn), to first a kebab shop, thence to an abuser's house and finally a police station. At the take-away joint Phadlut Sharma is AJ, a flashily impressive (to Tia at least) Asian man who knows how to groom and who quickly impresses the naive child. Inside the bedroom of torture however, we are subject to the excruciating pain of what Tia has to endure. There is so much blood and shouting however, that Davies' dramatic impact is lost amongst the yells. It's not pleasant to watch, but it's also not that moving either, drifting dangerously close to prurient sensationalism in place of dramatic structure. When the scene shifts to the police station, Sharma, who here doubles up as a disinterested detective, fails to convince. As we read the real life nightmares of agencies charged with protecting children and which failed abysmally in their duties, Sharma’s cop is just too much of a poorly fleshed out shallow cliché. The strength of this piece however rests with Cooke’s superhuman performance. Just out of drama school, Cooke throws herself vocally and physically into this most consuming of performances. And when, in the closing scene, Katie invites her back home for dinner with her mum, Tia's struggling to comprehend such an unsolicited act of kindness, amidst a world that has only shown her contempt, is truly heartbreaking. In the light of the Rochdale and Oxford abuse scandals (to name but two) there is an important story to be told here. Davies doesn't pull his punches, but sometimes "less is more". One only has to think of Bryony Lavery's Frozen, a play that that dealt with the harrowing impact of murderous paedophilia but which had no onstage horrors, relying instead only upon a brilliantly crafted narrative and commentary. Davies is to be saluted. Whilst his writing is sometimes patchy, Firebird is a brave and contemporary play that tackles a horrendous situation, head on. And in Callie Cooke’s performance, Edward Hall has unearthed a cracker of a leading lady.